We have recently added some beautiful new pieces to our store--if you like color, you will love these! 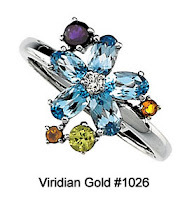 Blue Topaz surrounded by citrine, peridot and amethyst dazzle the observer in our Gemstone Flower Ring, #1026. These are all securely set in a quality 14K white gold setting, and like most of our rings, we can custom size it for you in 1/4-size increments. 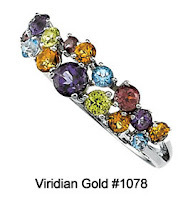 Or, if you want a ring with color that is not quite so wide, check out our equally dazzling Muliti-Color Gemstone Ring, #1078, which boasts amethyst, blue topaz, peridot, garnet and citrine gemstones for a stunning five-color effect. The stones are set in a fine dual-rail 14K white gold setting which can be sized just for you. 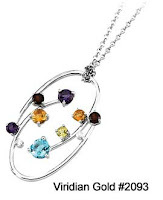 If you are looking for color, but not in a ring, consider our beautiful Multi-Gemstone Bypass Necklace, #2093. Fabricated in fine 14K white gold, this necklace is composed of a pendant of diamonds, blue topaz, peridot, citrine, garnet and amethyst, all suspended on an 18" 14K white gold rolo chain. Check out these and many other of our colorful gemstone jewelry pieces, grouped by stone type, in our Gemstone Jewelry collection!